Nike has officially unveiled Comme Des Garcons Nike VaporMax collaboration that was debuted during the CDG Paris Spring 2017 Collection runway show. 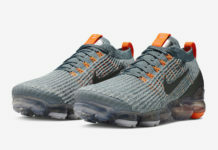 The lace-lees sneaker, the Nike Air VaporMax, which were designed by CDG founder Rei Kawakubo come dressed in either a Black and/or White color options. Look for the COMME des GARÇONS x Nike VaporMax Pack to release at select Nike Sportswear retail stores in early 2017. UPDATE: London based Dover Street Market and Nike NYC will be debuting the COMME des GARÇONS x Nike VaporMax tomorrow, February 10th. The non-collaborative Nike VaporMax colorways will debut in March 2017.